Cover art, saxophone music and Death to the Daleks (1974) | Randomwhoness: a Doctor Who blog by Johnny Spandrell. Sampling stories in random order. Some Doctor Who stories are defined by what happens in them. The Green Death, for instance, will forever be The One With The Giant Maggots (an episode of Friends we’d all like to see, I think). Earthshock, The One Where Adric Died. Victory of the Daleks, The One with The Dalek Design Everyone Hated. (Bit harsh, but a bit true). To me though, Death to the Daleks is the ’burning Dalek’ story, and is defined not by what happens in it, but by the one image most associated with it; that of a Dalek on fire. It comes from an incident in Episode Two, when the Daleks have come under attack from the local inhabitants of this week’s planet, the quarry-like Exxilon. The Exxilons are armed only with spears, arrows and a can-do attitude, and they set on one Dalek, who (inexplicably) explodes and catches fire. That provided the on set photographer with a great opportunity to snap away, and so we have lots of photos of the Dalek flambe. I think I’m right in saying that’s the first (only?) time we’ve seen a Dalek on fire. It’s a moment which must have stuck in the audience’s collective memory. 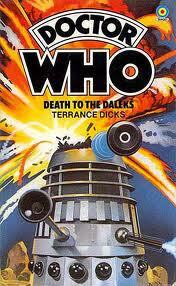 When Roy Knipe came to paint the cover of the Target novelisation, the exploding Dalek was the image he chose. And it’s a great cover; colourful, eye catching, unit shifting. It had a life beyond the novelisation too; there was certainly a poster of it and I think it was used as a promotional image for the book range too. If there was a Doctor Who art prize (and there should be), this would surely be a contender. That image pursues Death to the Daleks through all its incarnations; the VHS release, the Target reprint, the DVD release all feature an exploding or burning Dalek. 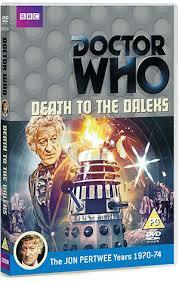 It seems you can’t release Death to the Daleks in any format without a Dalek in distress on the cover. The story’s unusually declamatory title probably skews the cover designs in this direction, but there is some form here in other stories. It’s understandable Horror of Fang Rock needs a lighthouse on it no matter the format, but you also, apparently, must have an image of the Doctor carrying a load of old rope. It’s mandatory, it seems, to have clockwork cogs on any release of The Invasion of Time. And so on. The other element which, um, distinguishes Death is its groovy, saxophoney music. It belongs to a subset of Doctor Who stories from the late sixties and throughout the seventies which I think of as the “not Dudleys”. And as genius as regular series composer Dudley Simpson’s work is, you can have too much of a good thing, and so the handful of stories from this period he didn’t score stand out. Cary Blyton (whose most famous work is not from Doctor Who, but the theme song to Bananas in Pyjamas, long burnt into the memory of Australians and their kids) produced three eclectic Not Dudley scores, and Death‘s is the oddest. It’s difficult to imagine the train of thought which starts with “what’s the most effective way to score a Doctor Who?” And ends with “Why, with a saxophone quartet, of course!”. Dudley never had many players at his disposal but he did seek to use a variety of instruments. Blyton on the other hand must have been a passionate advocate for saxophone’s versatility to devote a whole serial to showcasing it. The score is at its most distinctive when it uses Blyton’s theme for the Daleks, which climbs and falls through a series of scales, giving them a faintly Clouseau-esque appeal. You know the one I’m talking about, don’t you? Stuck in your head now? If not, relive it here . So those are the stand out elements of Death to the Daleks: it’s book cover and its music (and I’m tempted to add the Dalek which stands in shot idle, operator-less, hoping the viewers won’t notice). Jeez, that must make it a fairly unremarkable story in its own right? Um, yes. Yes it does. Well, more generic than unremarkable. At this stage, writer Terry Nation was well into recycling elements from his previous stories. Once again, a small group of space exlporers are at odds with the Daleks. Once again, there’s a hostile indigenous species. Inevitably, there’s mining. Even the Exxilon’s living city, sometimes cited as the story’s stand out idea, is really just a bigger badder version of a similar machine which got too big for its boots from The Keys of Marinus. But there is one fresh and unique idea at this story’s heart: that robbed of power, the Doctor and the Daleks are forced to collaborate. That scenario has legs even today. Imagine: the current Doctor discovers a colossal threat – a new breed of vicious, power-mad Time Lords wannabees perhaps. So he’s forced to align himself with the only force we knows can beat such a threat – his oldest enemies. The Doctor standing alongside legions of Daleks. A new time war is declared. Cue end of episode. I’d watch that. Even if they drenched it in saxophone music. LINK to The Awakening. In both, the Doctor’s female companion is threatened with being burned alive. At least I think that’s what’s suggested in Death; it’s never actually stated how the Exxilons are going to sacrifice Sarah, but there’s a shot of her staring into some flames. Good enough for me. After all, The Awakening is the story of tenuous links. NEXT TIME… You’re so gay! Random’s first Eccleston story is Aliens of London/World War Three.